Shazam! has proved a troublesome property for DC. The mixture of wholesome superheroism and childhood identification that propelled the original Captain Marvel to phenomenal success in the 1940s died when the original publishers ceased publication in 1953. Times had moved on when DC acquired the property in the early 1970s, and Marvel now holding the trademark to the character name, meant it couldn’t appear on covers. 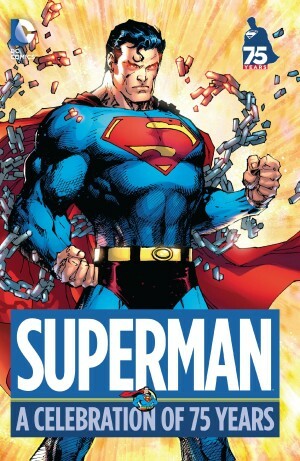 A 1990s revival helmed by Jerry Ordway has been the only significant success in almost fifty years despite numerous attempts to attune the character to modern times. 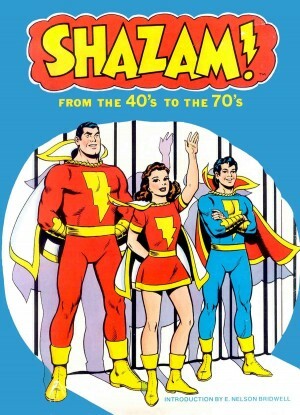 For well over half the 75 years being celebrated Captain Marvel, or Shazam as he’s now known, has been out of print. Artist C. C. Beck is indelibly associated with the original feature, and his gloriously economical cartooning features more than any other artist. He benefits enormously from bright restored colouring providing a futuristic gloss to his 1940s work, and greatly develops as an illustrator over the strip’s run. Homeless newspaper seller Billy Batson personifies innocence in a sanitised world as he’s escorted through a subway tunnel to be bestowed with the talents of six mythical heroes. 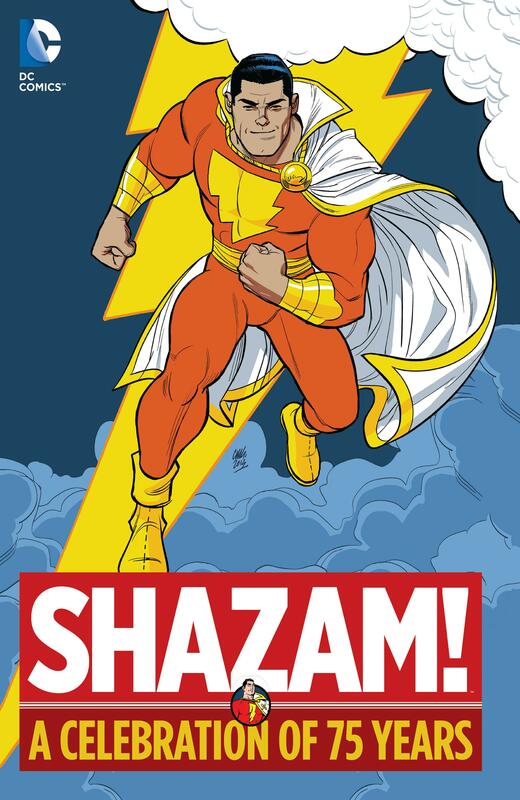 A crucial concept was that although he transformed into the adult Captain Marvel, the world’s mightiest mortal, it was still youngster Billy Batson’s mind in control. Beck and primary writer Otto Binder surrounded Captain Marvel with family variations years before Superman, down to Hoppy, the Marvel Bunny. 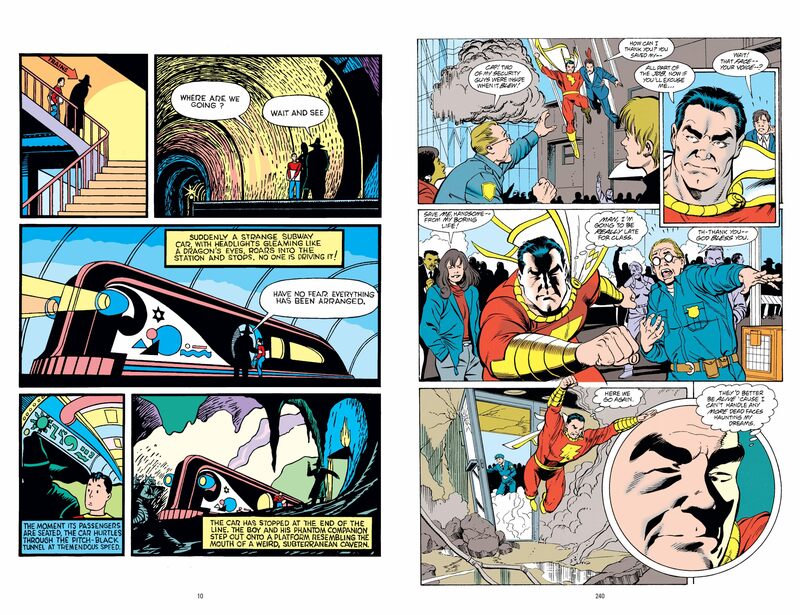 Mary Marvel’s introduction is presented, and there are also examples of Captain Marvel Jr’s adventures. Mac Raboy’s illustrative work on that feature remains very highly regarded, but not best represented in this collection, which features stiff and pedestrian art in places. Raboy’s wonder is better seen in the earlier anthology From the 40’s to the 70’s. The 1940s material has been selected to feature Captain Marvel’s three primary enemies Dr Sivana, Mr Mind and Black Adam, and although simple, it’s still a lot of fun. The 1970s section opens with Elliot S! Maggin’s clever insertion of a Captain Marvel like character into a Superman comic as DC toyed with rebranding as Captain Thunder. E. Nelson Bridwell’s take is more successful than more acclaimed writers Denny O’Neil or Roy Thomas, better capturing the simple charm, and it’s with the accomplished Don Newton that Captain Marvel switches from cartooning to the traditional superhero look in 1982. Closing the section, Alan Grant and Barry Kitson setting the innocent Captain Marvel against his polar opposite in Lobo starts well with provocation, but loses originality when the inevitable fight breaks out. Ordway’s introduction to his work on Captain Marvel from 1994 displays why his re-boot was a success. He achieves the fine balance of reverence and modernisation, and artist Peter Krause (sample illo right) combines modern day layouts and storytelling techniques with a hint of the cartoon incarnation. Their collaboration is very good, and the second tale a subtle exploration of a tragic topic. There’s a knowing smugness to the work of Joe Kelly and Duncan Rouleau, but Geoff Johns compensates with a touching JSA tale. 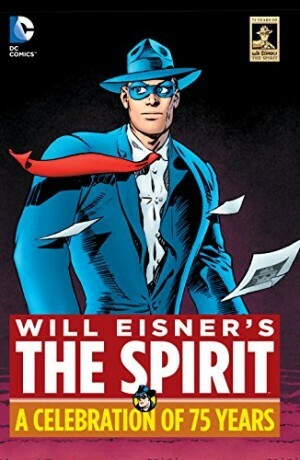 Jeff Smith rolls back the decades with his interpretation, which is another re-boot, with far younger versions of Billy and Mary, possibly a mistake, but handled well. Johns closes the book with a revision so drastic it seems pointless, but excepting does it no favours, and it’s better than this iconclastic section makes it appear. 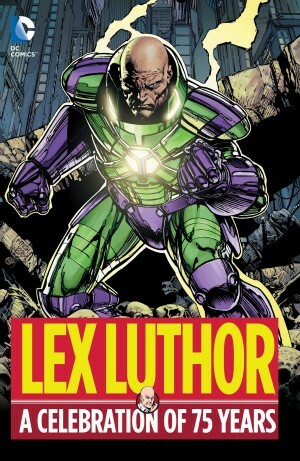 It’s very well drawn by Gary Frank, although with no relevance to tradition. While there are mis-steps, this is an enjoyable collection and better than many others in 75 Years series as the 1940s work maintains an appeal.